Would somebody please tell the sax player this is a one way street! This evening was the beginning of a series of street performances that will take place, literally, in the middle of the Saigon streets during the nightly rush hour. 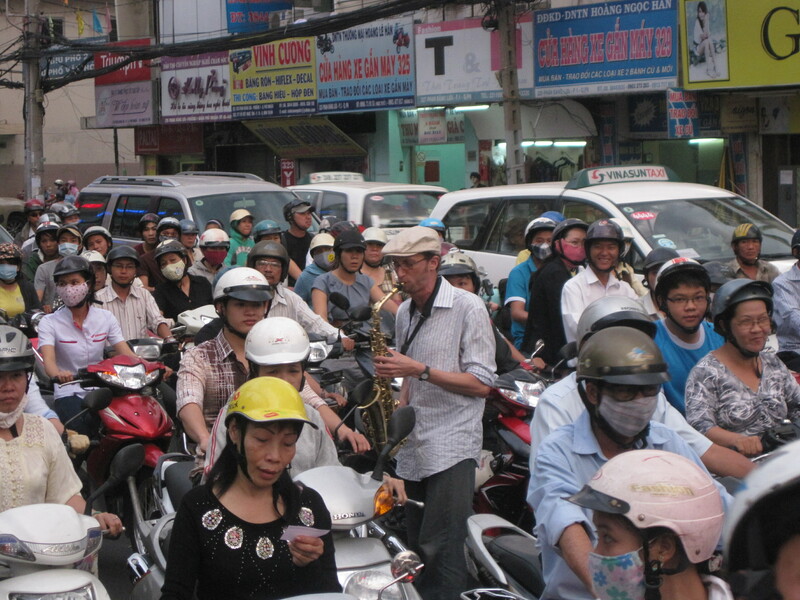 The traffic in Saigon is a truly amazing thing. More than 99 percent of the vehicles on the road are motorbikes, and when the congestion is very thick, it is every bit as intimate as the crowded New York subway. Unlike the streets in the USA, where people mostly drive cars, there is no social separation between drivers; people are not in enclosed air-conditioned vehicles, with their ipods plugged into the charger. 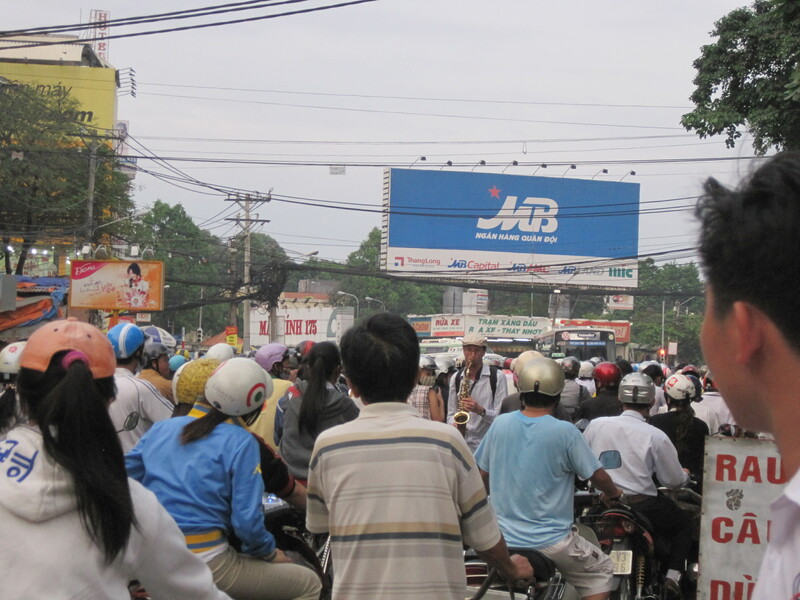 The roads are something that the many drivers experience together more intimately in Saigon than anywhere I’ve ever been. Sidewalks, on the other hand, are tough to come by here, and when you find them, they might be used for motorbike parking or street vendors. The late urban theorist Jane Jacobs wrote that sidewalks “bring together people who do not know each other in an intimate, private social fashion… The sum of such casual, public contact at a local level – most of it fortuitous, most of it associated with errands, all of it metered out by the persons concerned and not thrust upon him by anyone – is a feeling for the public identity of the people, a web of public respect and trust, and a resource in time of personal or neighborhood need. The absence of this trust is a disaster to a city street. Its cultivation cannot be institutionalized. And above all, it implies no private commitments.” I find that Jacob’s observations about sidewalks (based on her life in New York) are actually more true of streets in Saigon. It is on the streets here that one observes tensions and triumphs in the public trust. 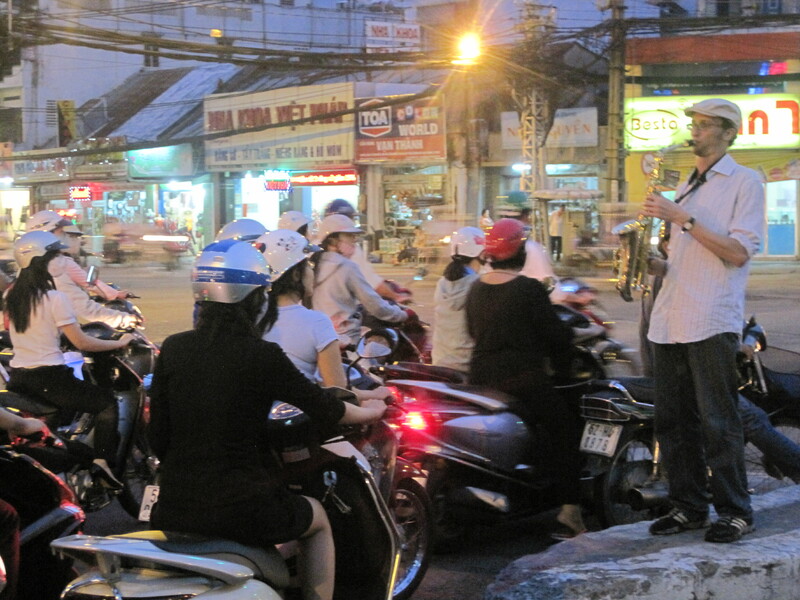 In effect, the traffic codes in Saigon are mostly irrelevant; the safety of the streets is upheld and maintained (or not) by the vigilance of millions of individual drivers, not by any collective respect for the rule of law. 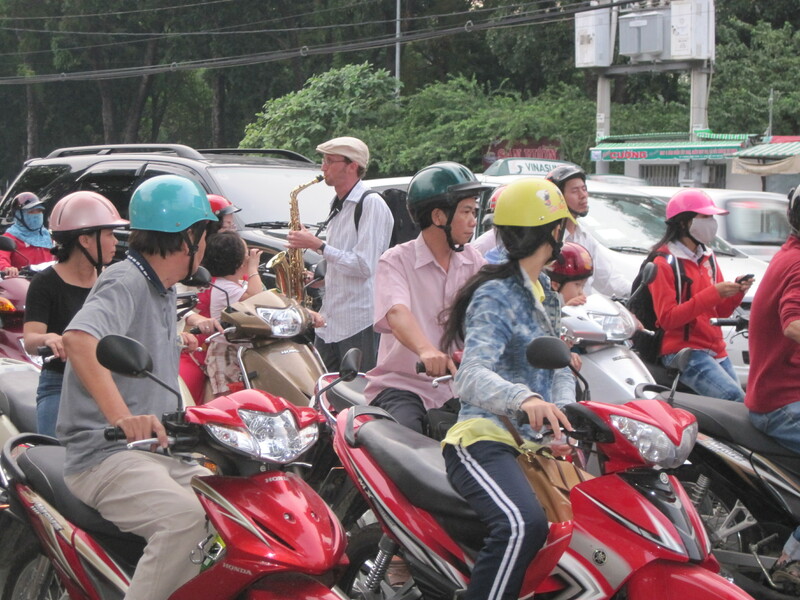 In the USA, drivers will be mostly concerned with obeying the traffic code; in Saigon, the drivers are concerned with being in tune with the other drivers whatever may happen. It’s not unusual for people to go the wrong away down one way streets, and busy intersections are quite a frenzy, with the motorbikes turning every which direction. The safe driver in Saigon will not seek to be in the correct lane (what lanes?) Instead, the safe driver will be aware of the other drivers and will seek to properly communicate his or her direction and objective, perhaps with body language and facial expressions. Generally speaking, I have great respect for the ability of the Vietnamese people to drive in an anarchic but careful fashion. 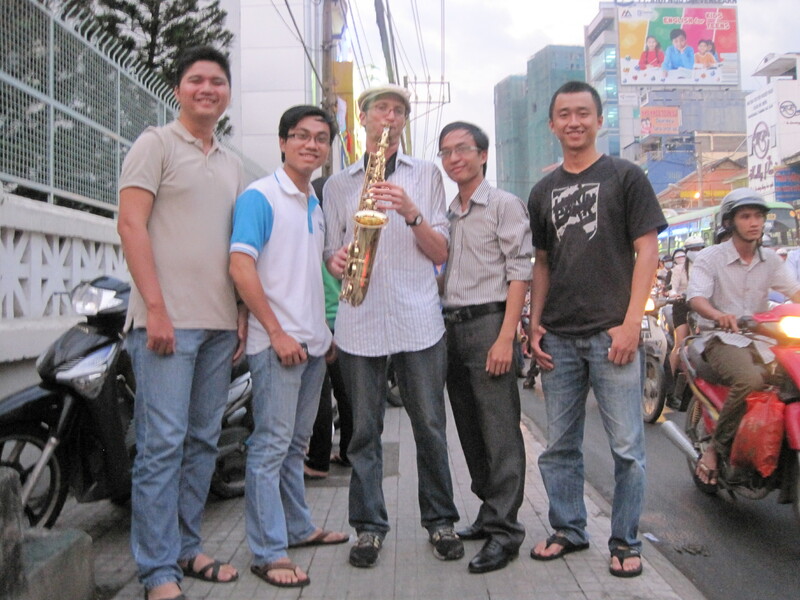 This evening I played near a traffic light on Hoang Minh Giam Street near the Gia Dinh park. I didn’t know what to expect, but it went wonderfully. Many people offered smiles, thumbs-up, laughs, and applause. One man wanted to know if I was trying to promote any particular religion (which I was not.) A journalist went out of her way to do a u-turn, so she could check it out more and interview me. If you speak Vietnamese, you can read her nice article at this link. Jane Jacobs, if she were still alive, would call me a public character. “A public character is anyone who is in frequent contact with a wide circle of people and who is sufficiently interested to make himself a public character. A public character need have no special talents or wisdom to fulfill his function – although he often does.” She claims these people are integral to the vitality of sidewalk (or street) culture. This evening’s rush hour I performed at Nga 5 chuong cho, a traffic circle also known as the “dog cage.” While I have already discussed that I have brought sidewalk culture into the street, this evening demonstrated how the streets encroach on the sidewalk in Saigon. The sidewalk was full of motorbikes whizzing past. 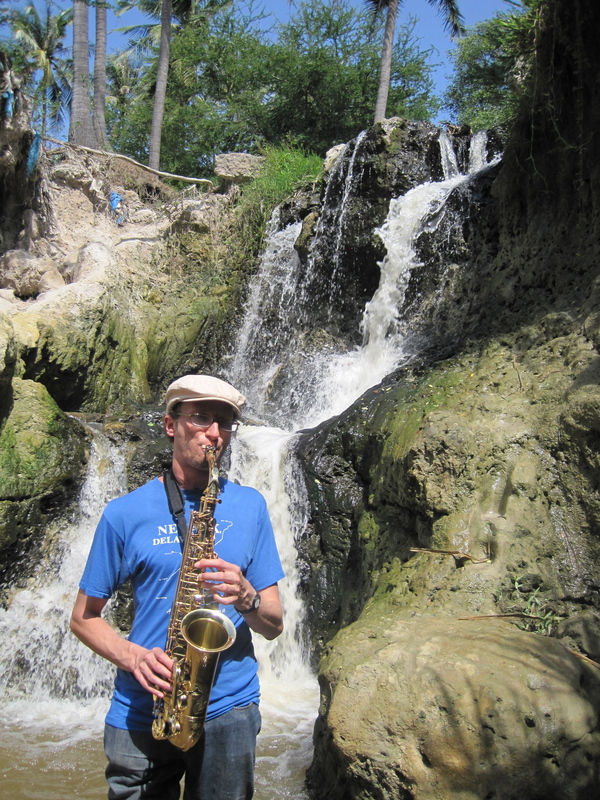 If the automobile traffic is on the sidewalk, sure why not play saxophone in the street? What’s the difference? 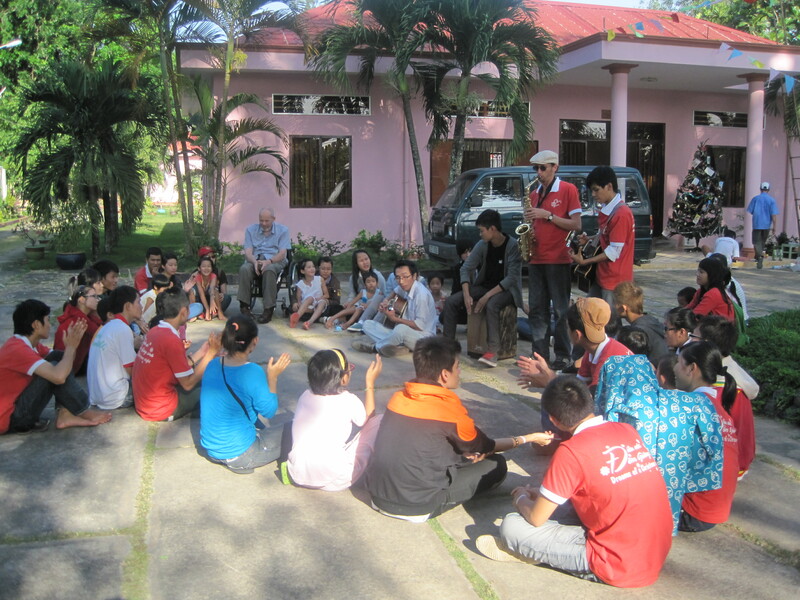 In the morning, I and the crew from Dreams of a Christmas Night at Ho Chi Minh University of Industry made our first trip to a school for underprivileged children that their event benefited. Holiday gifts were distributed, games were played, and music was performed. 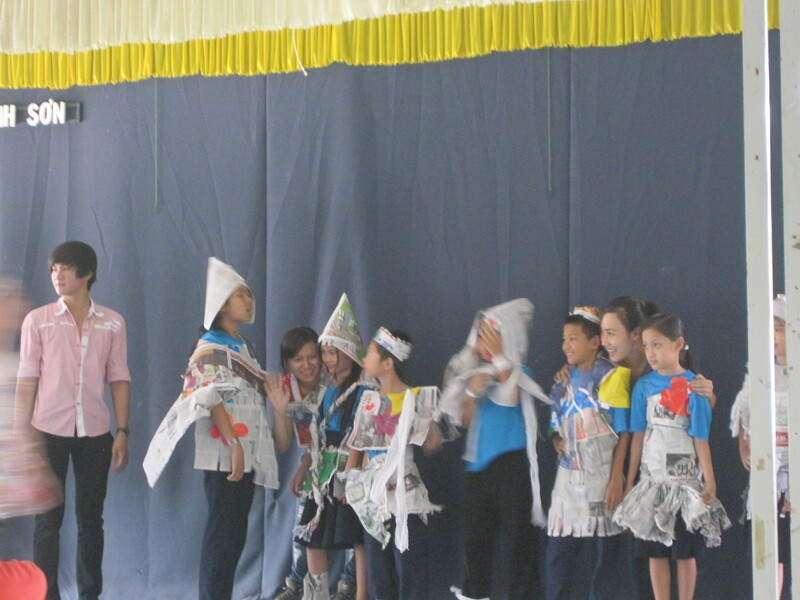 The best part, though, was when the kids put on a fashion show, featuring clothes they made themselves out of newspapers. The best fashion show ever! 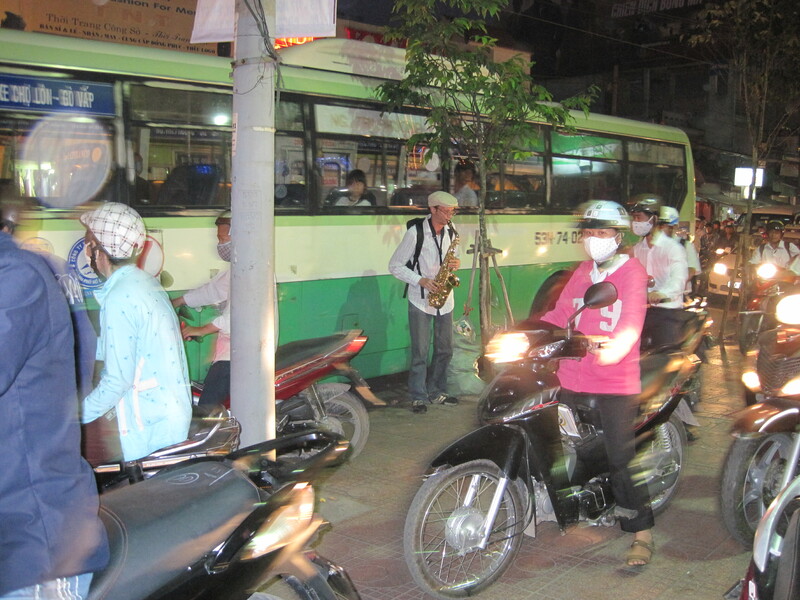 The evening brought another rush hour performance at the Phu Nhuan intersection, in which I was joined by some journalists. You can read the article and see a nice video on TuoiTre News. Some young men stopped and asked a lot of questions. One of them said he’d never seen a street performer before. Now, I wonder if he’s under the impression that all street performers, literally use the middle of the street as their stage. Later, one lady tried to put money in my pocket, but I refused. From my perspective, the motorbikes went as far as the eye could see. What a view! Today was the final part of the Dreams of a Christmas Night, a fundraiser event held last week. As follow-up, I and the students from Ho Chi Minh University of Industry visited two orphanages and an HIV clinic, all within a couple hours of Saigon. Holiday gifts were distributed to the needy residents, games were played, and music was performed. It was great to be part of such an enthusiastic group of university of students. I’m so proud of them for their hard work and successful efforts. At the HIV clinic, housing children born with HIV and many terminally ill patients. The Parade of One project is grateful for it’s many supporters. It is contributions from individuals like you that make Parade of One possible. Please consider making your tax-deductible donation today by visiting the Parade of One website. At the time of this publication, we are still offering holiday gifts for donors, but only while supplies last.